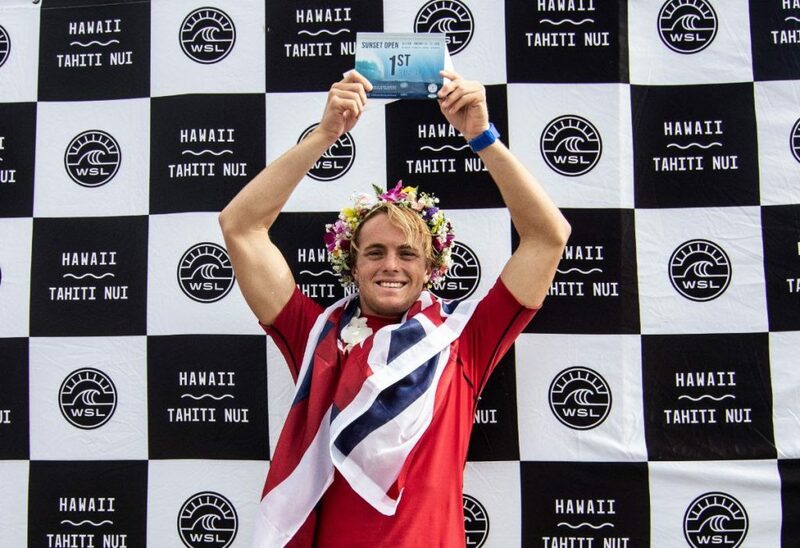 Maui’s Cody Young  was crowned the 2019 champion of the Sunset Open in iconic conditions that ranged from 12-to-15 foot swell, bringing in 18-foot plus-size faces to finish the event. Young faced three former Sunset champs including defending event champion, and fellow Maui native, Billy Kemper , 2017 Sunset Open winner Jack Robinson (AUS), and 2018 HIC Pro champ Kiron Jabour of Oʻahu. But, the first-time QS finalist put nerves aside and posted a 17.77 (out of a possible 20) heat total — including a near-perfect 9.10 (out of a possible 10) and 8.67 back-to-back. WSL says Young‘s consistency was the key to earn him a Finals appearance after securing a spot into the Quarterfinals and Semifinals with runner-up advancements before taking over his Semifinal heat against fellow Maui natives Imaikalani deVault  and Ian Gentil , along with eventual fourth-place finisher Jabour. The Sunset Open/Pro Junior is presented by the Hawaiʻi Youth Surfing Development Organization, a nonprofit providing greater opportunities for local youth in and around surfing. Full results and heats scores are available at worldsurfleague.com .